The longstanding way most of us have viewed germs is the reason this situation is so stressful: germs are nasty, we think. We should do everything in our power to keep our children and their belongings away from them. So we stock up on hand sanitizer, antibacterial wipes, and disinfectant spray in the hopes that we can keep our children sterile and healthy. But not only is this impossible—bacteria, fungi, and viruses coat us and our babies and every inch of the space around us—it may also be wrong. Most of the microorganisms living on and around us (making up the “microbiome”) are harmless, or even beneficial for health. Scientific evidence is showing that exposure to a variety of germs can be good for kids, and in fact, this exposure might be a crucial way to reduce the risk of immune-related chronic diseases later in life. The rising incidence of allergies and other autoimmune diseases that start in childhood has led scientists to start looking at the factors that might increase a child's risk. A study of kids in rural Austria, Germany, and Switzerland found that those who were asthma- and hay fever-free in later childhood happened to be those who were exposed to a farm environment and drank farm milk (that is, raw milk) in the first years of their lives. Studies in other parts of the world have shown that the more siblings a child has, the less likely he or she is to have an allergic disorder; and if he or she lives with a pet dog, the risk is also lowered. So what is it with farms, raw milk, siblings, and dogs? Well, each of these provides exposure to a huge variety of microbes that scientists suspect are 'talking' to a child's immune system as it develops. It starts early: when a baby is still living inside its mother before birth, its gut is lined with immature immune cells. After birth, when microbes colonize the gut and other parts of the baby, these immune cells start multiplying and changing their activity. Somehow, scientists say, the bacteria are teaching the immature immune cells not to over-react to them—after all, these types of cells will have to live side-by-side with bacteria for the rest of the child's life. If the immune system cells are not taught properly by microbes in early life, they might become over-reactive, causing allergies, asthma, and other diseases. Many details of this story have yet to be figured out, and scientists are working on it. Many more things in a child’s life—especially a course of antibiotics—could affect the bacteria in the gut and therefore the messages received by the child’s immune system. But it's not too soon to know that a little germ exposure in a child's life can be a good thing. That's not to say common sense should be thrown out the window: pathogens (or disease-causing bacteria) do lurk, although they are often outnumbered. In the pacifier-on-the-floor situation, the parent shouldn't just unthinkingly cram it back in the child's mouth. But neither does the parent have to confiscate it until it can be sprayed with Lysol and boiled for an hour. There's happy medium somewhere. 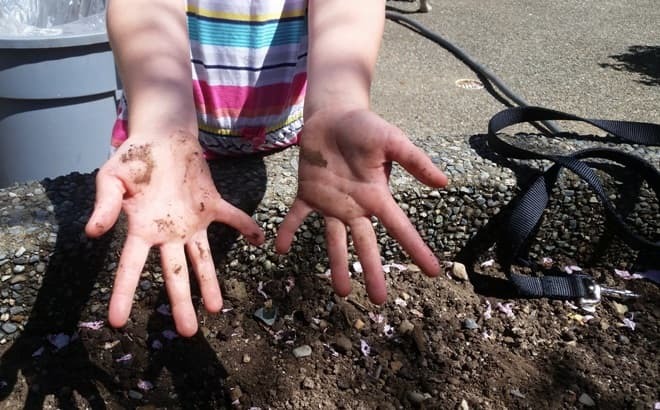 Several scientists have now written books on this topic that approach the nuances of getting dirty: how and when kids should wash their hands, and what the evidence says about sterilizing kids' bottles and dishes. Let them eat dirt by Brett Finlay and Marie-Claire Arrieta was published in 2016, and Dirt is good by Jack Gilbert and Rob Knight, will be released this year. Both are good, practical reading that will help you get used to the idea that kids and germs are a good combination. So parents, right now: go ahead and toss the hand sanitizer.